Crowne Plaza Changi Airport is offering a Buka Puasa buffet from next month to July. Japanese integrated shopping and dining concept Emporium Shokuhin will be launching an Ehime Food & Sake Fair next week, during which Takujo Japanese Dining will be serving a seven-course menu paired with four Ehime sake labels. The menu includes Jakoten Katsu, Mikan Dai Carpaccio, Tokusen Sashimi, Kasago Karaage-style and genmaicha ice cream. Food Opera at Ion Orchard is reopening today after a two-month revamp. New stalls include Ya Hua Bak Kut Teh, Xing Lou Seafood White Bee Hoon and Ah Yat Kitchen. Halal-certified cafe FIX has introduced a Mexican-themed menu, with items such as tortilla salad with lime dressing ($8++) as well as chicken enchiladas ($14++) and pulled beef enchiladas ($16++), both served with cheese in tortilla wraps. FIX' s naanwiches have been reborn in the form of fajitas, such as Chicken Achar Fajitas ($18++) and Beef Kimchi Fajitas ($19++). There are also dishes in hearty portions such as Chicken Pascal ($16++), Steak & Potatoes ($22++) and Lamb Shank ($25++). For dessert, go for Bunuelos & Ice-cream ($8++), a crispy tortilla glazed in sticky gula melaka with vanilla ice cream. Lime Lobsterfest is back at Parkroyal on Pickering's signature restaurant. The menu, influenced by Asian and Western flavours, will feature dishes such as Maine lobster thermidor with persillade crust, Maine lobster with truffled Hollandaise and Espelette pepper, Singapore lobster laksa, chilli lobster, black pepper lobster and Maine lobster with salted egg. Also on the menu are cheeses, sushi, sashimi and rotisserie chicken with roasted vegetables. Desserts include durian pengat, Nonya kueh, Belgian chocolate and a chocolate fondue fountain. Chefs from The Luxury Collection Hotels in Austria, Greece, India, Italy and Thailand will showcase the indigenous flavours and tastes of their countries in the Epicurean Journeys pop-up chef dining series in Singapore next week. Participating chefs are India's Manjit Gill (Monday), Italy's Dario Parascandolo (Wednesday), Thailand's Manachai Konkangplu (Thursday), Greece's Sotiris Evangelou (June 3) and Austria's Manuel Gratzl (Wednesday and June 3). La Ventana by Carles Gaig at Dempsey Hill is serving a new Spanish High Tea, featuring items such as Spanish Iberico Ham with Crystal Bread, churros and scones and jam. As part of its Food From The Heart royal theme, The Kitchen Table at W Singapore is presenting Cod Save The Queen in a supplementary menu with hot and cold dishes and a carving station. Highlights include Britain's culinary exports such as Beer Battered Fish And Mushy Peas, Baked Toad In The Whole, Duck Fat And Rosemary Potatoes, Yorkshire Pudding and Beef Wellington. It is berry time at Mandarin Oriental Singapore's Axis Bar & Lounge June Afternoon Tea, with a spread of Violet Berry Jelly, Mixed Berries Rosella scones, Classic Blueberry Roulade, Lychee Strawberry Lemon Pound Cake, Blackberry Yoghurt Mousse and more. OverEasy Orchard is marking International Burger Day this weekend with the launch of a new burger, The Hangover Part IV. Sandwiched between a toasted English muffin is a sunny-side farmhouse egg, heritage breakfast ham, double smoked bacon, its signature wagyu chuck blend patty, rosti, red cheddar and sweet chilli sauce. The Ramadan Iftar meal at Holiday Inn Singapore Orchard City Centre's Window on the Park begins with a plate of dates and nuts. Besides items at the seafood station and local favourites such as laksa, mee goreng, mee siam and oyster omelette, there will be chicken, mutton and beef dishes as well as Ayam Panggang Jakarta, Ikan Goreng Assam Manis and Sauteed Mussels In Sambal Belacan. Desserts include Bubur Hitam, Nonya Kueh and Steamed Tapioca With Coconut Cream. Diners can win up to $400 of healthy lifestyle products in a weekly lucky draw. Savour Balinese cuisine at the Ramadan buffet dinner by Kintamani Indonesian Restaurant at Furama RiverFront. The carving wagon features daily specialities such as Paha Kambing Bakar (grilled lamb leg) and Kebab Ayam (grilled chicken sharwama). Chef's specialities include Roti Jala Kari Ayam (net bread with chicken curry) and mains such as Ketam Sambal (chilli crab). Included is unlimited iced bandung or iced syrup. Separately, there is also Nasi Tumpeng, featuring a turmeric rice mountain with dishes such as beef rendang, chicken and vegetables. Crowne Plaza Changi Airport, in collaboration with Rajah Mas Catering, is offering a special Buka Puasa buffet promotion. The Iftar spread has traditional Hari Raya favourites such as beef rendang, fried sambal prawns, curry mutton with potatoes, Ayam Masak Merah, Ikan Assam Pedas, nasi briyani with raisins, signature laksa, sayor lodeh, tom yum seafood soup, bubur cha cha and Nonya kueh. Resorts World Sentosa is giving traditional rice dumplings the haute cuisine treatment with a set of five dumplings combining flavours from its Celebrity Chef restaurants. The set, in a three-tiered bamboo steamer, comprises sea whelk, dried oyster and unagi rice dumpling (from Forest by celebrity chef Sam Leong), five-spice Berkshire pork rice dumpling (Osia Steak & Seafood Grill), organic barley and quinoa rice dumpling (Tangerine), five-grain abalone rice dumpling (Feng Shui Inn) and ohagi sweet dumpling (Syun). The black garlic glutinous rice dumpling ($18++, photo), at Mandarin Oriental Singapore's Cherry Garden, contains glutinous rice, fragrant black garlic, sea whelk, preserved vegetables, kurobuta pork belly and bamboo charcoal powder. The red yeast glutinous rice dumpling ($16++) is a combination of glutinous rice, conpoy and red yeast minced chicken. In the signature classic golden pearl dumpling ($34++), the glutinous rice captures the flavours of slow-braised abalone, pork belly, mung beans, mushrooms, chestnuts, salted egg yolk and lotus seeds. The Dragon Boat Festival Hamper gift set ($108++) of five dumplings in assorted flavours comes with Chinese tea. Summer Palace at Regent Singapore is celebrating the Dragon Boat Festival with two new seasonal rice dumplings - the Crocodile Meat & XO Sauce dumpling ($22) and a black sesame with honey version ($13) - besides the classic abalone and vegetarian varieties. 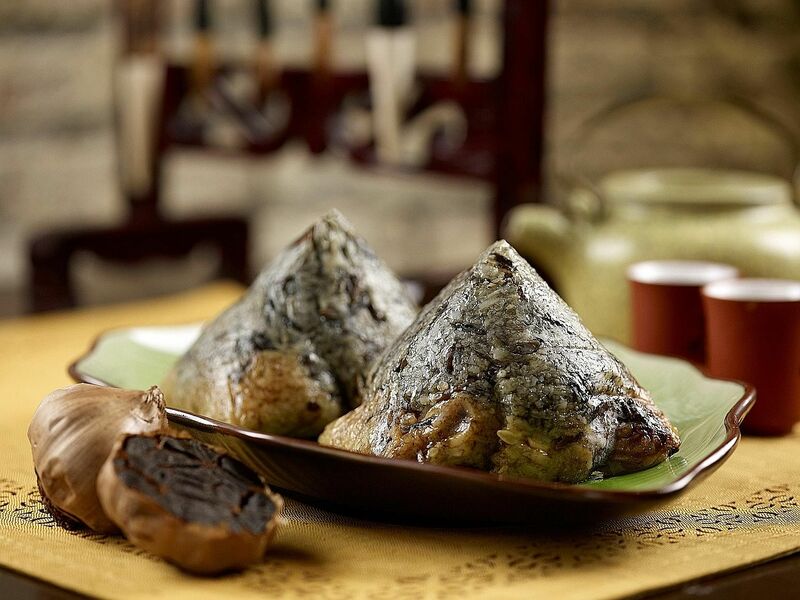 The Crocodile Meat glutinous rice dumpling marries spicy XO sauce with chestnuts and black mushrooms. The Abalone Rice Dumpling ($38) is made with abalone, black mushrooms, chestnuts, green beans, dried scallops, roasted duck and salted egg yolk, while the Eight Treasures Vegetarian version ($22) uses steamed mixed-grain rice and ingredients such as morel mushrooms, bamboo pith, sweet corn, black mushrooms and chestnuts. The international buffet spread at Carousel, Royal Plaza on Scotts, will feature items such as stir-fried chilli mud crabs with crispy golden mantou, oven-roasted OP ribs marinated with black pepper and mustard grain with jus and live herbal prawns in superior broth. Desserts include hot chocolate pudding, banana walnut crumble with berries compote and gugelhupf cake with toppings. Diners can win dining vouchers and a weekend staycation at the hotel's Royal Club Premiere Room with breakfast for two. Chef de cuisine Ken Zheng of Pan Pacific Singapore' s Edge will showcase his version of traditional Rickshaw Noodles with a contemporary twist. As a tribute to his father and grandfather, he has adapted their recipes with his speciality sauce. His grandfather' s heritage soup is represented through his dry handcrafted banmian dish with simmered pork belly and sous vide egg and served with the original classic pork and anchovy soup broth. Other highlights for the Father's Day dinner and Sunday Brunch spread include Wagyu Short Rib Rendang, Tokusei Ikazushi (stuffed squid sushi with seasonal vegetables) and Bossam (Korean simmered pork belly with housemade kimchi). Dine "underwater" with dad at Resorts World Sentosa's Ocean Restaurant By Cat Cora. The Father' s Day Lunch features sous vide Scottish salmon roulade with crustacean emulsion, caviar vinaigrette and green vegetable slaw; wild mushroom and truffle soup with smoked milk and pine nuts; a choice of main course from confit French yellow chicken leg, New Zealand fish bouillabaisse or, for $10++ more, Baked Glacier 51 Toothfish or Braised-Seared Wagyu Beef Short Rib. This event at Zafferano Italian Restaurant & Lounge features labels from Cecchi, a Tuscan winery, and its owner and winemaker, Andrea Cecchi. The dinner includes the Chianti Classico Riserva di Famiglia 2012 and Coevo 2011 and the wines are paired with dishes by chef Marco Guccio. Items include poached and pan-seared octopus, housemade veal ravioli, lamb rack cooked two ways and slow-cooked US prime beef short ribs with truffle potatoes and artichokes. The 2016 Singapore Fete le Champagne at Sofitel Singapore Sentosa Resort & Spa will feature the grandes cuvees from champagne houses such as Roederer, Bollinger, Perrier-Jouet, Taittinger, Billecart-Salmon, Deutz, Laurent Perrier and Mumm. The event will start with a tasting of the grandes cuvees in magnum bottles, followed by a five-course champagne pairing dinner with a Chateau Pichon Lalande 2005 matching the main course. Dishes include salmon tartare, poached Boston lobster and braised beef short ribs. Dessert will be an Earl Grey bergamot tart with raspberry compote. Saint Pierre is presenting an evening in the Chateau Angelus Winemaker's Dinner World Tour Series with Hubert de Bouard de Laforest. Featured Bordeaux wines from the appellation of Saint-Emilion include the 2012 Le Carillon de L'Angelus, Saint-Emilion Grand Cru, and Chateau Angelus, Saint-Emilion Grand Cru (2011, 2006, 2005, 2004, 1996 and 1995). Chef Emmanuel Stroobant's menu includes lobster, foie gras, smoked bacon, veal, lamb and petit fours. Wine Connection's Voilah! French Festival ends with a French wine dinner hosted by two winemakers from Loire and Rhone Valley on Monday. Starting with Chateau de Montgueret - Saumur Brut Rose (Gold Medal Paris 2015) as the welcome drink, the menu includes chicken liver parfait, penne pasta tossed with pulled duck legs and signature slow-roasted beef tenderloin. Other wines featured are Chateau de Montgueret (Rose d'Anjou 2014) and Chateau de Fesles (Bonnezeaux 2013). Organised by wine distributor Magnum Spirits & Wine and its e-commerce arm 75cl, World of Wines is back in Singapore. The event will showcase more than 200 wine labels from more than 20 international wineries. Correction note: An earlier version stated that The Kitchen Table at W Singapore is presenting Cod Save The Queen till June 9. It should be till June 2.